An exciting new model of adult literacy teaching for Aboriginal students is being piloted in Wilcannia NSW. The pilot will utilise an internationally recognised mass literacy campaign model not previously used in Australia. The Yo! Si Puedo or Yes I can! 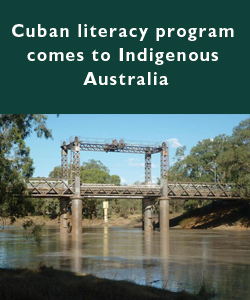 model was developed in Cuba in 2000 and has been successfully adopted in over fifteen countries including New Zealand, Argentina and Timor Leste to increase literacy rates amongst Indigenous populations. Funded by the Commonwealth Government, the project is being facilitated by the University of New England in partnership with The National Aboriginal Adult Literacy Commission. The Wilcannia Local Aboriginal Land Council is the lead agency for the implementation of the project with support from the Wilcannia Central School. It is well known that literacy levels among Aboriginal adults in Australia are significantly lower than those in the non-Aboriginal population. While there has been no national-level attempt to measure literacy levels in the Aboriginal community, evidence from various sources suggests that at least 35% of the Aboriginal and Torres Strait Islander adult population have minimal English language literacy, with the figure rising much higher in rural and remote areas. Many Aboriginal leaders believe that these low levels of literacy are a major impediment to improvements in a range of other areas, including health development, community governance, economic participation and involvement in school education and post school education and training. The pilot is following the three-phase campaign model which includes promotional and community education to mobilise the community; literacy classes; and post literacy activities. It commenced in August last year and is scheduled for completion in August of this year. The method was originally developed by the Pedagogical Institute for Latin America and the Caribbean (IPLAC). It is a unique method of teaching literacy via audio-visual lessons. The method is in some ways fairly traditional in that its is based on learning the letters of the alphabet, followed by words, followed by sentences. However the Cubans introduced their own innovation, which they call alphanumeric. This involves the learners first associating each letter of the alphabet with a specific numeral. The rationale for this is that many non-literate people do in fact have basic numeracy and will therefore learn their letters more easily by this associative method. IPLAC understood that it is not possible to lower illiteracy rates on a national scale in most countries where the need is greatest without a low cost, simple mass method capable of reaching very large numbers of people in a short space of time. Its central feature is a set of sixty-five one hour lessons on DVD/video, which the students watch under the supervision of local monitors. Each lesson shows on screen a class of non-literate learners (played by actors) being taught by an experienced teacher. Under supervision, the local monitors are able to help their students follow the DVD teacher’s instructions and, using printed manuals and workbooks, complete oral and written exercises being modelled on the screen. Jack Beetson of the National Aboriginal Adult Literacy Campaign Commission is the on-site project leader. Quest will continue to report on the success of the pilot. This article is based on sections of the Aboriginal Adult Literacy Campaign Pilot Project Background report written by Bob Boughton.